Honda's new hydrogen production facility in Swindon previews the future of the car - and it doesn't involve petrol, diesel or batteries. "Hang on, haven't we heard all this before?" (I hear you cry). Well, yes, but this time it's different. For starters, the new site produces its own hydrogen. Previously the hydrogen filling station shipped in hydrogen by truck - but now it is all produced on site using solar energy. As you can imagine, trucking hydrogen around isn't great for the environment. But now, Honda claims the process is completely carbon neutral. Solar energy is used to split water molecules into hydrogen and oxygen. The oxygen is released and the hydrogen retained. The hydrogen can then be used to power cars, which are essentially electric vehicles with their own power plant on board. Since these don’t rely on batteries they are more versatile than the EVs you can buy today – you can top them up like you would a petrol or diesel car, with no long wait for a full charge. Sounds like the future, right? Unfortunately hydrogen fuel cell vehicles are expensive and rare. Currently you can get a Hyundai ix35 fuel cell EV, but getting an actual figure on cost is impossible - you have to lease them. Toyota is due to bring a hydrogen car to market in 2015 which should be priced from £40,000 - a far cry from the £1m FCEVs of five or ten years ago. 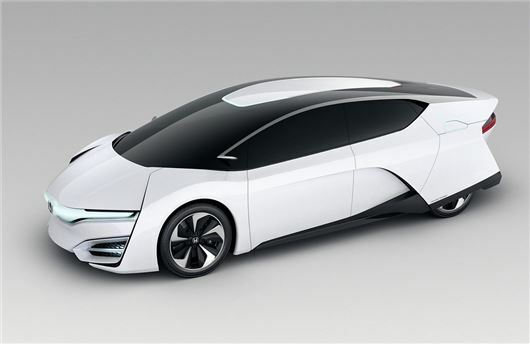 Honda will also replace the stillborn FCX Clarity with a new hydrogen fuel cell vehicle in 2015 (pictured above) and like the Toyota it should (we are told) be relatively affordable. With more fuel cell vehicles on the road there’s going to be more demand for hydrogen, which is why Honda’s new hydrogen filling station is so important. If it is a success, it could show how the future roadside filling station might operate; entirely self-contained, the fuel for cars will be made on site rather than brought in by trucks and because solar energy is used to make the hydrogen there will be no fossil fuel anywhere in the chain. The same can’t be said for battery powered EVs, which are charged from the mains using energy from the national grid – some of which comes from coal and gas. Obviously, this won’t be the case forever – energy companies are investing ever more money into renewable energy, including wind and solar power. There’s probably not going to be a winner when it comes to future fuels – chances are we’ll be driving a mixture of battery powered or hydrogen fuelled cars, much like we do currently with petrol and diesel cars. Hydrogen power does face an uphill struggle though, due to the lack of infrastructure. There really aren’t many hydrogen filling stations in the UK – but again this is something that should change in time as the technology for producing hydrogen becomes cheaper and smaller. If more fuel stations like Honda’s can be built in large numbers, and they’re successful, then the case for a hydrogen car is going to get a lot stronger. That said – manufacturers of battery EVs aren’t resting on their laurels; electric cars are already on the road and the infrastructure for them is growing. The EV is even desirable, thanks to manufacturers like BMW and Tesla getting in on the act. With all the investment that’s going into EVs, expect faster charge times and better battery capacity as the battle for the future of cars rages. Great Post Honest John! The Solar Hydrogen Revolution has Begun! Honda's new station takes away the Hydrogen Bashers main talking point. They just don't know it yet. They'll ignore it for awhile. Solar Hydrogen is the Fuel of the Future- and the Future is NOW!